We work on several digital solutions for the Food specialty industry. 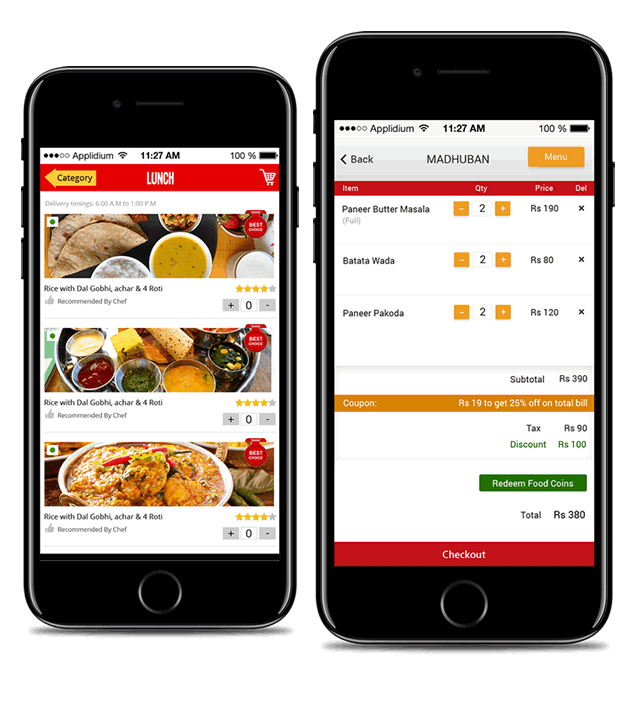 Based on our expertise and regular offerings we came up with Ready Made Food delivery mobile app solutions company which actually work to exceed your business automation & jump in sales. Although not limited to below solutions, we also take the custom requirement and can design & code any customize Food delivery or ordering app solutions. Each restaurant should have a website to showcase their special dishes & ambience if they provide dine-in services. Food ordering & delivery feature scale your capability to cater more orders with the same facility. Start your B2B platform to promote & market restaurants in your area with Food ordering & online payment options. Get your simple mobile app to show case your menu & important information about your food joint. Give facility to your cusomters so that they book dine-in tables in advance through mobile apps. Facility to order favorite foods online through mobile apps this will increase your orders. Give reward points on each order to your customers to make them loyal to your business. Wireless check-in experience for your customers. You can notice coming customer from the distance. Push latest offers on your customer mobile app when ever they come near around to your food joint. Push special offers to all the customers who have installed your mobile app. Manage online orders placed through website or mobile app & deliver ontime to the doorstep of the customer. Delivery guy gets order notification on mobile app and submit status of delivery time. We have almost 10+ years of experience in providing solutions for design & development of Food Delivery Web & Mobile App Solutions for food industry business. Our team first understand your business requirements, your audience, your geographical area of business & then provides strategies to capture the market through various Ready or Customised Food Delivery Solutions. Not Only this, We have already worked with many innovative features in the past like Proximity Marketing through ibeacons, WireLess Check-ins to Provide Reward Points to your regular customers, Smart Reward Points Card Wallet for your Customer, Contact Less Payment Wallet Solution for Food Business, Self Ordering Kiosk Development for Restaurant, Restaurant POS Development, Etc.